Tigers rescued from Thailand temple Jump to media player Wildlife authorities in Thailand have begun removing tigers from a Buddhist temple after accusations of wildlife trafficking and animal abuse. Tackling Taiwan's animal smugglers Jump to media player Taiwanese authorities face a growing challenge to stop a wide and bold network of animal smugglers who have been tapping into the island's rich reserves to profit from China's huge appetite for wild animals. Tiger cubs found in plastic boxes Jump to media player Police arrest two men suspected of smuggling tiger cubs and hundreds of other animals in Thailand. Bid to end illegal wildlife smuggling Jump to media player Nearly 200 governments are to meet in Thailand to discuss ways of halting the illegal trade in wildlife around the world. Wildlife authorities in Thailand have begun removing tigers from a Buddhist temple, after accusations of wildlife trafficking and animal abuse. 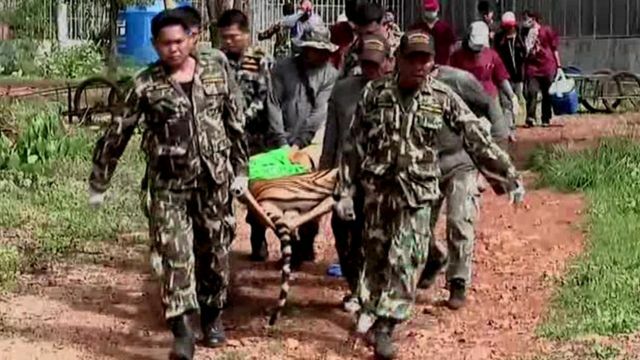 Three of the 137 tigers at the temple in Kanchanaburi province were moved on Monday in an operation involving around 1,000-personnel. The monks, who deny all allegations, resisted at first but gave in when presented with a court order. The tigers are being taken to animal refuges, authorities said.